We have observed that whenever somebody is planning to stay in Germany and going for the first time, he has got lot of questions. We have tried to answer lot of them on the website, but still there will always be more and more questions. Sometimes there are questions which people hesitate to put on public forum. Now, we have started a concept of Mentoring on our website where Indians who are living or have lived in Germany can come forward to help their fellow Indians. The mentors will be from same city where help seeker would like to stay in future. Also once the person is in Germany he can look forward to someone for help. We don't expect that mentors to be expert, but the desire to help their fellow Indians. Our vision is that such kind of interaction will help everyone. If you would like to be a mentor contact us. Please include some description about yourself (name, city, number of years in Germany etc.) so that we can understand that for what queries we can contact you. Also join our facebook page. We would like to update the website also with the new information, which can be helpful for others. If you would like to get anwers contact us. Please include some description about yourself (name, city, your queries etc.) Also join our facebook page. Responses will be given by email. 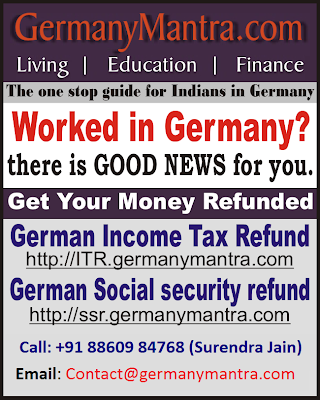 GermanyMantra.com is not getting any monetary benefits out of this initiative. This is completely free service.